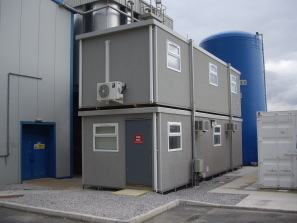 Located in Cheshire and comissioned by an Electric Generation Company, these purpose built, double-stacked jackleg units now provide much needed, additional office accommodation, toilets and welfare facilities to this busy industrial site. These jackleg units provide a total floor area of 61 sq. m and incorporate 2 No. offices, 1 No. meeting room and 2 No. toilets as well as a fully equipped kitchen and mess room. The jackleg units are double-stacked to maximise use of the available space (each unit measuring circa 9.70x3.13m). Access to the first floor level is by way of a robust steel staircase. Both jackleg units are fully Building Regulation compliant. Internally, the walls and ceilings are finished in easy to maintain vinyl faced plasterboard whilst the floors are finished in 2mm Polysafe standard vinyl. Each unit is fitted with a heat/cool air conditioning system to maintain a constant temperature. Externally, the walls of these jackleg units are finished in a resin based texture (clients choice of colour). The roofs are constructed with a mono-pitch flat roofing system and covered with a hard wearing 'Hypalon' blanket c/w square section uPVC rainwater goods. These double stacked jackleg units are an ideal solution to providing maximum additional space where available floor areas are at a premium. These buildings were delivered, installed and commissioned on-site within one day, thereby keeping disruption to the client to a minimum!